This morning the chase was on for the details from last night’s closed-door meeting on how to reduce greenhouses gas emissions for deforestation and degradation–REDD. Was REDD dead? Would it survive? After initial reports that the talks had fallen apart, delegates regrouped and reached a compromise on one of the most controversial issues: indigenous populations. 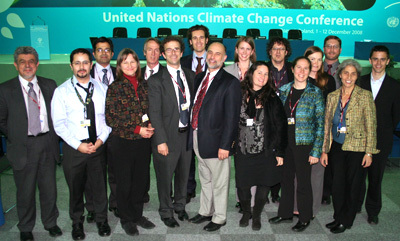 The EDF team gathers in the plenary hall where ministers will begin deliberating Thursday. Delegates from a technical workgroup agreed that nations must give indigenous people a voice in discussions on how to reduce greenhouse gas emissions from deforestation and degradation and must recognize international rights treaties. “This is a crucial step forward. Is it everything indigenous people want and deserve? No but it guarantees talks will advance and indigenous groups will be heard,” said Steve Schwartzman, EDF’s director for tropical forest policy. Today’s agreement will be handed off to government ministers arriving in Poznan Thursday. And tonight there’ll be plenty more issues to chase.